Every week I try to declare one day a Weave-to-my-Heart’s-Content Day. On these days I give myself permission to let go of the to do list and sink into the joy of weaving. It’s a day with no commitments, no need to leave the house other than to walk Codi. The only thing on the agenda is weaving. 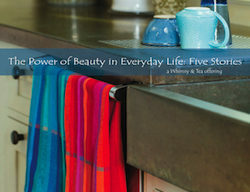 If I decide to do other things –photograph towels, write, run errands – I can, but there’s no pressure, no expectation. I look forward to these open days when I can focus on starting a new project or weaving what’s already on the loom. I experience a sense of freedom and contentment as I tune into the flow of my energy. I have decided that I need more days with no commitments other than to weave. 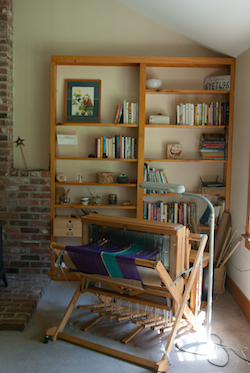 In May I wrote about stepping away from my loom for a bit to replenish my tired spirit. The kind of replenishment I need now is to give myself time to fill up with the joy of weaving. I am taking a little break from writing articles every month so that I can have more weaving time. I am not sure when I will start writing again. It’s possible that the Whimsy-grams will take on a different form when I return. During this retreat of sorts I will still be in business. I will be at the Northampton Winter Farmers’ Market every other Saturday and I will continue to update my online store and my calendar. I may send an occasional email about events or what I’ve been weaving. Although I won’t be showing up in your inbox as regularly, I’m still here and would be happy to hear from you with any questions, special requests or feedback.